Marietta (Minerd) Crosby was born in 1870 in Bridgeport, near Mt. Pleasant, Westmoreland County, PA, the daughter of Eli and Mary Ann (Baer) Minerd. On Feb. 15, 1887, at age 18, Marietta traveled to Scottdale, Westmoreland County, to marry her beau, 21-year-old Lewis G. Crosby (1866-1931). Marietta's dark wedding dress, fashionable in its day, is seen here. The Crosbys made their residence near Bridgeport. 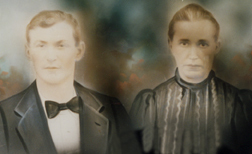 Their eight children were Lucinda Kelly, Lloyd M. Crosby, Maria "Mattie" Bowman, James Crosby, Alice Fehr, Richard Eli Crosby, Eathol M. Crosby and Francis Yelaine Crosby. Lewis worked as a master mechanic for more than four decades at the Buckeye and Morewood coal mines of the H.C. Frick Coke Co., part of the Carnegie Steel Company, later merged into U.S. Steel Corporation. His son Francis once said, "All Dad knew was eat, sleep, work." Located near Mount Pleasant, the Morewood Mine frequently was the scene of sometimes deadly violence in disputes between management and labor over wages and, ultimately, the right of unions to organize at the works. Morewood made national news in April 1891 due to labor unrest, with the company pitting Welsh and Irish against Hungarian and Slav as replacement workers in a strike. Lewis would have been age 21 at the time, and in his sixth year of Frick employment. The recent troubles in the coke regions of Westmoreland County, Pa., were the natural results of the presence in that district of about five hundred Hungarian and Slav coal miners, coke drivers, and other employés , who have been drawn thither from time to time until the Welsh and Irish have been almost entirely driven out... The striking employés of the Frick Company's works discharged themselves, and the owners of the works thereupon employed other men to take their places. Then the strikers undertook to drive these men away and to destroy the property of their employers. In pursuance of their purpose they marched in large numbers, in the darkness of the night, against the company's works, many of them being armed with guns and pistols, while others carried sticks and various weapons. Upon their approach they were warned to desist from their aggressive purpose, but pushing forward, they were met with a sharp volley from a body of deputy sheriffs armed with Winchester rifles. The result of this was that seven of the rioters were instantly killed and a large number wounded. Three of the latter subsequently died. The killing of the assailants produced a profound sensation among the working people of the district, and it was found necessary to call out two regiments of militia, the Governor of the State very properly maintaining that he had nothing whatever to do with the merits ... but that it was his duty to maintain and enforce the laws of the State at all hazards. For a day or so the coke region presented a very warlike appearance, and all manner of wild, incendiary talk was indulged in, but the rioters were ultimately convinced of the utter folly and uselessness of their course and quiet was restored... The dead foreigners were buried with much pomp and ceremony, five thousand sympathizers following their coffins to their graves. An artist's sketch of the exchange of gunfire at Morewood is seen here. 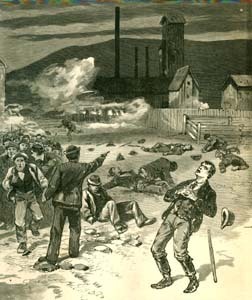 The violence at Morewood was just a prelude to the following year's much-better known "Homestead Strike of 1892" where 35 men were killed and at least 400 injured in the "bloodiest and most crucial labor conflict in American history," wrote Leon Wolff in his 1965 book, Lockout. It involved a battle in Pittsburgh between 13,000 workers affiliated with the fledgling Amalgamated Association of Iron and Steel Workers, and Pinkerton National Detective Agency security teams hired by Carnegie Steel to protect the massive Homestead works. Wrote Wolff: "The mill owners were led by Henry Clay Frick, the iron-willed coke king. Although the surface issue was wages, the basic issue was Frick's determination to break the union and run the mill as an open shop." 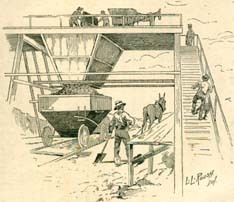 One of the coal loading facilities in the Mount Pleasant region, at which Lewis no doubt would have worked, is seen here. How Lewis and Marietta were involved or coped with the anxiety of such a violent community environment is not known, but can only be imagined. There is no question, though, that they would have had to have been very strong to live with that natural fear always in the back of their minds. As her family got larger almost every year, Marietta was sickly and often unable to provide proper care. Her eldest daughter Lucinda carried much of the responsibility for raising the children. In May 1912, the Crosbys moved to a new home in Stauffer, near Mt. Pleasant. Eldest daughter Lucinda, in a penny postcard to her cousin Lula (Stairs) Swift, wrote: "
Mama is sick to day. Her heart is so bad. Lulu you will have to excuse this dirty card. I am run out of cards. Will you and Bessie send James a card Sat June 10. He will be 14 year old. On Feb. 1, 1911, Lucinda wrote: "Mama isn't any better." On March 7, 1912, Lucinda wrote: "Mama is better and so are the kids and I am glad of it. I am washing today and I haven't a very nice day for it." Sometime in the early 1900s, Lewis and Marietta attended a Crosby reunion at Iron Bridge, near Mt. Pleasant along with Marietta's sister Mattie Stairs in the center. A photograph of the three sitting together shows that Marietta had streaks of premature grey in her hair. Marietta knew how to sew, and used her talent to make inexpensive but thoughtful gifts for the family. Just after Christmas 1911, she made a doll's hood for the young daughter of her niece Lula Swift. It was to be Marietta's last Christmas. In 1912, Marietta lay deathly ill in her Buckeye home, coughing violently. Her son recalled that "They said you could hear her out on the road." She passed away that August, though the specific date is not yet known. She was laid to rest at Greenlick Cemetery near Bridgeport. Eldest daughter Lucinda took over many of her mother's responsibilities, and helped raise the younger children. Lewis may have married again, to Lucinda (? ), as evidenced by the 1920 census listing of Westmoreland County. After a fall at the Morewood Mines, Lewis retired in March 1931, having completed 46 years of service. He was a master mechanic at the time. A newspaper article noted that at the time of retirement, he had been "in very poor health for the past five months." He only lived for six more months. He died at the age of 64 on Sept. 6, 1931. The Connellsville Courier said he had been ill ever since he had received his pension. He is buried beside his wife at Greenlick Cemetery. Sketches of the Morewood Mine shooting (by M. De Lipman) and coal loader (by L. L Roush) originally published in Frank Leslie's Illustrated Newspaper, April 18, 1891.